Review by AllTheBestFights.com: 2016-04-27, great performance by both fighters: Kohei Kono vs Inthanon Sithchamuang gets three stars. Kohei Kono entered this fight with a boxing record of 31-8-1 (13 knockouts) and he is ranked as the No.7 super flyweight in the world (currently the #1 in this division is Naoya Inoue). He lost to Liborio Solis in 2013 (4-stars-fight, Kono vs Solis) but then he has collected three victories and one draw. His opponent, Inthanon Sithchamuang, has an official record of 28-7-1 (17 knockouts) and he entered as the No.68 in the same weight class. He suffered his last defeat when he faced Jerwin Ancajas in 2014, after this bout he has won eight fights and drew with Espinos Sabu. 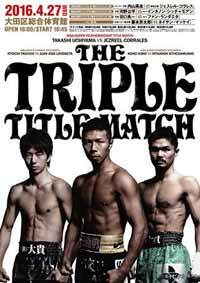 Kono vs Sithchamuang is valid for the WBA World super flyweight title; undercard of Takashi Uchiyama vs Jezreel Corrales. Watch the video and rate this fight!